Eye of the Dragon is a brand-new game from Novomatic with a totally different feel! 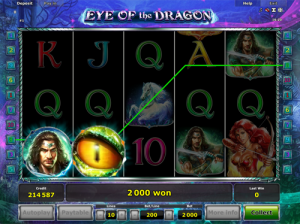 Eye of the Dragon brings a whole new vibe to Novomatic slot games. The whole design is totally fresh and you wouldn’t immediately recognise it as a Novomatic game. This fantasy slot game feels more like a story than a slot. There’s an enchanted world behind the reels and in that world lies a magical forest with magical creatures. The most famous of these creatures is the green dragon with eyes the colour of pure gold! Anyone who’s seen Avatar will be able to make a comparison between the enchanted forest and the one on Pandora. The dominant colours are green, blue, purple and pink. Although this slot may not look like a standard Novomatic one, it still has all of their characteristic features. You can play Eye of the Dragon in autoplay and in manual mode. In manual mode, you can gamble your wins. Instead of opening the paytable, you can press ‘info’ to get all of the information regarding payouts and paylines and RTP percentages. Eye of the Dragon has 10 paylines and there is a combined Wild and Scatter symbol that can also trigger Free Games. During the Free Games, there is a special feature that can help you get some big wins! The dragon’s golden eye is the most desired symbol in the game. It has special powers and can also trigger the Free Games. However, there are other ordinary symbols that will give you the majority of your wins. These include playing card symbols as well as a magical tiger, a magical horse, a hunter and a huntress. Symbols will pay out when you get the required number of matches to fall on a payline. There are 10 paylines and they all run from the left to the right. That means that the matching symbols need to fall on adjacent reels, starting with reel 1 (the reel furthest to the left). The more symbols you match up in winning positions, the bigger your payout will be. Eye of the Dragon is a high volatility slot so you’ll see the wins coming in thick and fast. Any player with any budget can enjoy this game as it’s fully customisable and the bets are easy to adjust. The dragon’s eye symbol is not only the Wild symbol but it’s also the Scatter symbol! How awesome is that. That means that the symbol will pay from any position and that it’s also capable of completing ordinary wins by stepping in to fill a gap! It can do this for any symbol as it’s an all-round substitute. The dragon’s eye is pure gold and whenever you see three of these staring back at you from the reels, you’ll have triggered the Free Games feature! This feature gives you Free Games that come with a special expanding symbol. This is a very common special feature that’s been seen in many Novomatic slots, especially the newer ones. This symbol will be one of the ordinary symbols and whenever enough land on the reels during the Free Games (either 2 or 3 depending on the symbol and the minimum matches for payouts for that symbol), the symbol will expand. It will expand so much that it will cover the entire reel it landed on and pay out multiple wins, even if the symbols aren’t adjacent! Eye of the Dragon might be a mysterious slot game but Novomatic is not a mysterious developer! You can count on them to make great slot games again and again. You can play all of their slot games, table games and live games for real money at Novomatic casinos. Have a read through our reviews to see our top choices for Novomatic casinos! If you enjoy this magical slot game, try out: Dancing Dragon, Sea Sirens, Dragon’s Pearl and Viking & Dragon.